The Moorcock Inn is situated on the A684 at the gateway to both the Yorkshire Dales and the Lake District and also lies within the Yorkshire Dales National Park. The inn at the junction of the A684 and the B6259 to Kirkby Stephen is the only public house on the 16 mile stretch between Hawes and Sedbergh and is an ideal place to stay whether looking for a relaxing retreat or a walking holiday. The spectacular sight of Dandry Mire/Moorcock Viaduct which crosses the mire can be seen from the inn and is only a short walk away. The viaduct with its 12 arches stands 50ft high and 227 yards long and is part of the Settle to Carlisle railway line on which steam trains run regularly. Originally the crossing of the mire was planned to be an embankment, but when construction started all the earth that the wagons brought in disappeared into the mire and so a viaduct was built. Cotterdale is a very picturesque small side dale and hamlet on the north side of Wensleydale. The last building at the end of the road through Cotterdale called Shepherds Cottage was built in 1616. The dale is drained by East Gill and West Gill which between them have nine waterfalls. They join to form Cotterdale Beck, which falls over three more waterfalls, including Cotter Force, below which the beck joins the River Ure. From the Moorcock Inn we walk forward on the side road, cross over the bridge and take the footpath on right. We follow the path and cross over the river bridge then we head uphill towards a gate. Just before the gate we head forwards at the footpath sign with the river on our left and the fence on our right. At the next bridge we do not cross over but keep heading straight on to Blades Farm. We walk to the right of the farm and shortly go through a gate at a footpath sign and turn right then cross over a ladder stile and head forward following the wall on our right. We keep heading forward quite steeply uphill through two gaps in the walls until we reach an old abandoned farm house. We go through the gate to the right of the farm then forward through the next gate. We cross over the track (The High Way) and head straight forward uphill on a faint path. The path becomes more distinct and we keep heading forward between two hillocks and past the grouse butts to the corner of a fence. We keep heading forward to a track and follow the track downhill into the wood. When the track bears sharp left we take the footpath on the right following the yellow arrow downhill to a track. We cross the track and head straight down to the stream. We cross the stream over some stepping stones then turn right and head through the fields to the road at Cotterdale. We turn right then almost immediate left through a gate with the river on our left. We follow the river for a short way then bear right over a footbridge then head forward to the left of a barn. We head forward and bear right to go through a gate then cross straight over a minor road at a footpath sign. We head steeply uphill to cross over a ladder stile. We keep following the path forward as it starts to level a bit to go through a gated stile. The path starts to go downhill bearing right to a stile to the right of some trees we go over the stile and head downhill towards the road. Just before the bridge and the road we turn right and right again through a gate. We head forward through the field go over the stile then through the next field to go over the stile in the wall then bear left. We keep heading forward passing a footpath sign as we head towards the trees in the distance. With the trees now on our right we cross over a ladder stile then continue to head forward. We go through a gate and follow the track which soon splits into two we bear left on the lower grassy path to the corner of a field and Yore House. We go through the gate and bear left to cross over the bridge, at the start of our walk, then bear left and retrace our steps back to the Moorcock Inn. This is a moderate to hard walk on gravel and grass paths/tracks with gates and stiles. There are some steep inclines and declines. 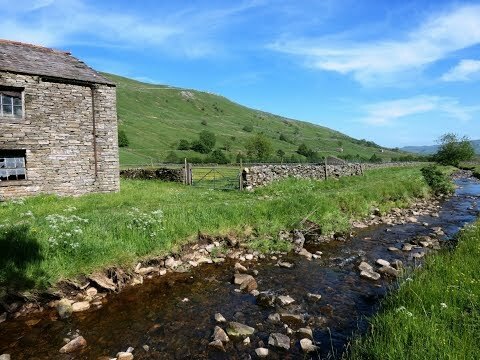 Approx 6.6 miles allow 3 hours using OS Explorer Map OL19, Howgill Fells and Upper Eden Valley. This walk is done clockwise. Start point: The Moorcock Inn. The Moorcock Inn is about 5 miles north-west from Hawes in Upper Wensleydale in the Yorkshire Dales. From the A1 take the A684 to Bedale, Leyburn and into Hawes. At the end of Hawes keep following the road round to the right on the A684 towards Sedbergh. Pass through Appersett and continue on the A684 to the Moorcock Inn on the right at the junction with the B6259. Parking: Free road side parking at the Moorcock Inn. There is no public toilets en-route. For refreshments there is the Moorcock Inn. The nearest public toilets are in the Market Place in Hawes near the car park. Hawes also has a good range of shops, tearooms, cafes, an excellent chippy and four pubs The Crown, The Fountain and The Old Board Inn in the Market Place and The White Hart Inn in Main Street.